Brand new designer Villa with private swimming pool and great views, located on a park-style plot surrounded by gorgeous native jungle and rice paddies! 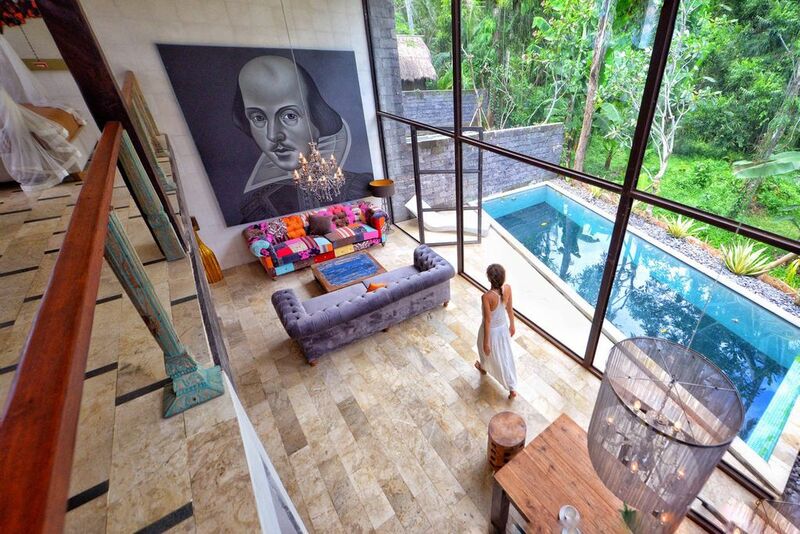 The villa has 1 amazing bedroom. There are various terraces with stunning views on the compound, own swimming pool, and huge swiming pool as part of the estate, large fish pond with lilies and other exceptional features nearby. The price included only accommodation, in case you would like to have any extra services like own chauffeur, car, massage or etc we can arrange it for you for extra charge. Please, let us know if any questions. Follow the road to pass famous Maya Ubud and keep on going down and up the following valley. Then on the next intersection drive right up the slope until the next T-intersection (in front of village hall), their left and before the small bride right again. Drive along the small jungle forest until the next T junction where you turn right towards the rice paddies. Here we are on the left side past the rice paddies.